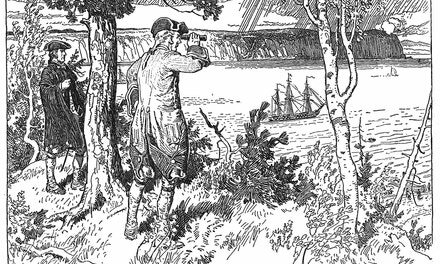 When the Marquis de Montcalm arrived in 1756 to take command of the French army in Canada he faced a difficult and unpromising situation. A gang of corrupt officials, led by the Intendant, Bigot, bled both the colony and the king; the Governor, Vaudreuil, fussy and incompetent, if not actually sharing in the robberies of the official bandits, winked at their offences; England, after years of hostilities along the frontier, had declared war; France, engrossed with her European conflict, spared only a few troops for Canada. Montcalm was an honest and high-minded man, proud, quick-tempered and vivacious, with a sound military training and an experience of warfare. He soon realized that his task was almost a forlorn hope; but for some time he succeeded in delaying the inevitable end, and, in spite of the greater resources of Britain and her American colonies, Canada more than held her own. 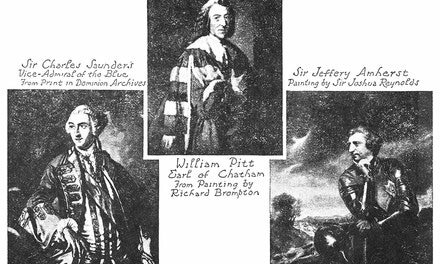 In 1757 the great Pitt, later Lord Chatham, joined the British ministry, and under his ardent leadership vigour and intelligence animated the war. 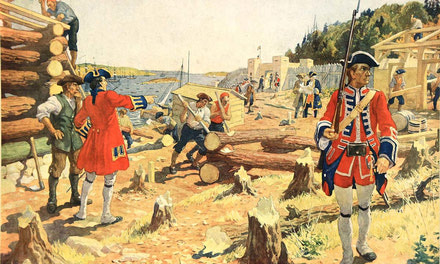 Three attacks against New France were planned; a combined naval and military expedition against Louisbourg in Cape Breton, one against Fort Du Quesne, now Pittsburg, and one by way of Lakes George and Champlain. Here at the southern end of Lake Champlain lay Fort Ticonderoga, an important post, but badly planned and poorly constructed by Bigot's dishonest engineers. The command of the British army against Ticonderoga was given to General Abercromby, a blundering and incompetent officer, whose political influence was strong enough to get him the position in spite of Pitt's reluctance to appoint him. Pitt, however, placed as his second in command Lord Howe, perhaps the most brilliant man then in the army. When Montcalm reached Ticonderoga at the end of June, 1758, he found the fort held by only three thousand men, insufficiently supplied with food and ammunition, to withstand Abercromby's army of fifteen thousand. On the 5th of July the British force embarked on Lake George. Nine thousand of them were provincial troops drawn from the American colonies, the remainder were British regulars, including a regiment of kilted Highlanders, the 42nd or Black Watch. Ample stores and ammunition were carried in bateaux, and a formidable number of cannon were transported in heavy flatboats. The advance of the flotilla, which covered the waters from shore to shore, under a cloudless midsummer sky, was a spectacle of such extent and magnificence as the peaceful lake had never before seen. The army landed at the north end of Lake George, which is connected by a winding stream with Lake Champlain. The advance party, under General Howe, marched through the woods toward the fort, distant about eight miles from their landing place. In the woods they encountered a French scouting party which they scattered after a sharp engagement. But Howe was killed by the first volley. His fall was a deadly blow to the expedition. The whole army seemed to lose all confidence. Abercromby, bewildered and uncertain, hesitated, and lost all the next day. Abercromby's French prisoners told that large reinforcements were hourly expected, and that Montcalm already had six thousand men, almost double their actual number. He believed them, and, without waiting to bring up his artillery, or to make a careful examination of the French position, he decided to attack it at once by charging it full force in front. Meanwhile Montcalm had laboured with furious energy on his defences. A breastwork of logs piled high as a man was built like a snake fence round the camp. In front of it thousands of trees were cut down and drawn together in a bristling tangle of sharpened branches. Throughout the hot summer day officers and men, stripped to their shirts, swung their axes. When night fell they slept beside their arms behind the breastworks. During the night four hundred men arrived after a forced march to join the garrison, with Levis, Montcalm's second in command. At daybreak on the 8th the roll of drums woke the weary men to work again until noon, when the sound of firing in the woods warned them of the approach of the British. The day was blazing hot. Montcalm threw off his gold-laced coat and, in his shirt sleeves, took a position from whence he could see nearly all the field of battle. As the British appeared at the edge of the woods beyond the fallen timbers he gave a signal, and a single cannon shot boomed from the fort behind him. Every man threw down his tools, seized his musket, and ran to his place in the three-deep line behind the zig-zag stockade. Companies of grenadiers, the biggest men in their regiments, stood ready to rush to any threatened point. The British, as they formed up, shoulder to shoulder, in four close columns, saw in front of them a confusion of fallen trees, on whose tangled branches the leaves hung shrivelling in the heat, and in the distance beyond, a glimpse of the breastwork and the glint of sunlight on protruding gun barrels; but not a single man of the defenders. The columns moved forward at the steady pace of a parade review - bluecoated provincials on the flanks, buckskin-clad rangers skirmishing in advance, regulars brilliant in scarlet and gold in the centre. Suddenly a blaze of fire and smoke burst from the stockade, and a volley of musket-balls and grape-shot crashed into the close-packed British troops. The front was swept away; but those behind pressed forward over those who fell. Again and again the storm of bullets struck them, as with bulldog courage they struggled through the entangled logs and branches. Sweating, cursing, shouting, they strove to advance, while the murderous cross-fire poured from the twisted snake-like stockade. Abercromby, a mile and a half in the rear, sent orders to charge again. Unlike Montcalm, who all day was in the thick of the fight, Abercromby never saw the field where his men were dying with such desperate bravery. Once more, and vainly, the British struggled forward. And all through the sweltering July afternoon, charge after charge was made through the bristling obstruction, amid a tempest of musketry fire. Some few gained the breastwork, and late in the afternoon a number of Highlanders forced their way over the stockade, where they were bayoneted by the French. Wherever the line was threatened, there was Montcalm or Levis, and the French grenadiers rushed to meet the danger. The useless loss of life went on until when evening came the exhausted British abandoned the attack, and sullenly retreated through the woods, cursing the obstinate stupidity and incredible callousness of the general who had driven them to slaughter. Abercromby gave orders to retreat, and abandoned any further attempt against MIontcalm, though his army still greatly outnumbered the French. In contempt, his humiliated soldiers dubbed him "Mrs. Nabbycromby," Nabby being a nickname for Abigail, then a female name common in New England. Pitt soon recalled him, and he retired with the disgrace of having caused the most disastrous defeat of the British arms in North America. In the picture the battle is supposed to be viewed from inside the French stockade. Montcalm is shown wearing a long-skirted waistcoat, although sometimes he, as well as other general fficers of this time, wore a cuirass, or steel breast-plate, in battle. 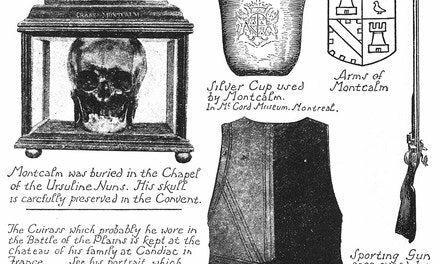 The cuirass which he is said to have worn at the Battle of the Plains at Quebec the next year is in the possession of his descendants at the family chateau in France, and shows the marks of bullets. Captains, lieutenants, ensigns and sergeants carried halberts, or espontons, short spears, as shown in the drawing, as well as swords. Most of the French regiments wore white coats trimmed with blue or red, a few wore blue, faced with white. Their wide long skirts were buttoned back from their legs, in the style of the French poilus during the Great War. Their legs were clothed in white knee breeches, with white gaiters reaching to the thighs, fastened with a row of many buttons. Except the grenadier companies, who wore high bearskin shakos, all wore low-crowned three-cornered hats, trimmed with white braid. The day on which the battle of Ticonderoga was fought was extremely hot, and it is recorded that Montcalm threw off his coat and directed the combat in his shirt sleeves, as shown in the picture.